Service providers are facing difficult times brought on by falling average revenue per user (ARPU) and the exponential rise in data traffic, which requires increased network infrastructure investment. Service providers are looking for new ways to generate revenue in order to boost the bottom line. 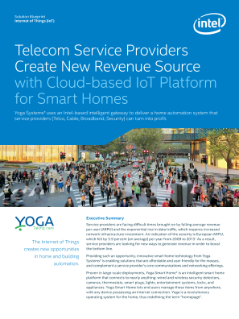 Providing such an opportunity, innovative smart home technology from Yoga Systems is enabling ...solutions that are affordable and user friendly for the masses, and complement a service provider's core communications and networking offerings. Proven in large-scale deployments, Yoga Smart Home* is an intelligent smart home platform that connects to nearly anything: wired and wireless security detectors, cameras, thermostats, smart plugs, lights, entertainment systems, locks, and appliances. Yoga Smart Home lets end users manage these items from anywhere, with any device possessing an Internet connection. Yoga is a revolutionary operating system for the home, thus redefining the term "homepage." Video: Open Data Center Alliance's initial publication delivery of eight usage model requirements for cloud.